After the 2.5" strips have been cut, you want to cut them into 2.5" blocks. You'll end up with a lot of 2.5" blocks. From here, you move on to ironing. After the squares are now in 2.5" blocks, it's time for the ironing. But first, set aside 2 blocks from each color that you will not be ironing. Step 1 - fold the 2.5" block in half. Use your spray starch if need to make it flat. Step 2 - fold the folded half block again into a square. Use your spray starch again if needed. The order in which you prepare all of your blocks is up to you. 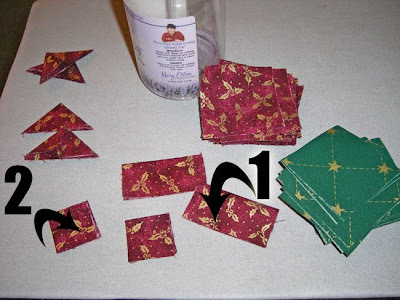 Meaning, do you do a completely iron and fold one block completely and then move on to the next one? Or, do you iron all in half first before you move on to the next step. Up to you. 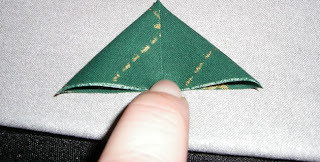 One you have your tiny twice folded square, you now open it back up to the original half size and then we fold the edges in to meet the center fold line. Think back to when you made your paper hats. You bring the right side into the center fold line and press and then you bring the left side into the center line and press. 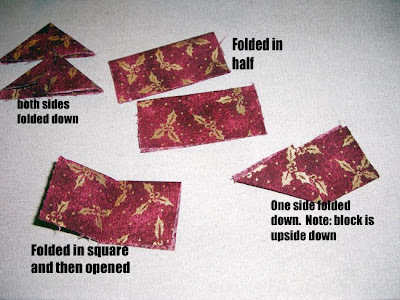 Or, you fold them both in, hold them with your finger or tweezers and then press at once. Be careful not to burn your finger like I usually end up doing :-) You will end up with mini triangles. Be precise when lining up the sides to the center, the closer (without overlapping) the better. Here I am holding one block before I iron it down. I would spray starch here to make sure it stays. 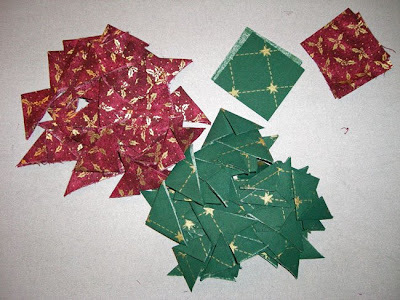 From here, it's just repeat, repeat, repeat until you have a pile of triangles such as this. Notice my saved blocks that have not been ironed.